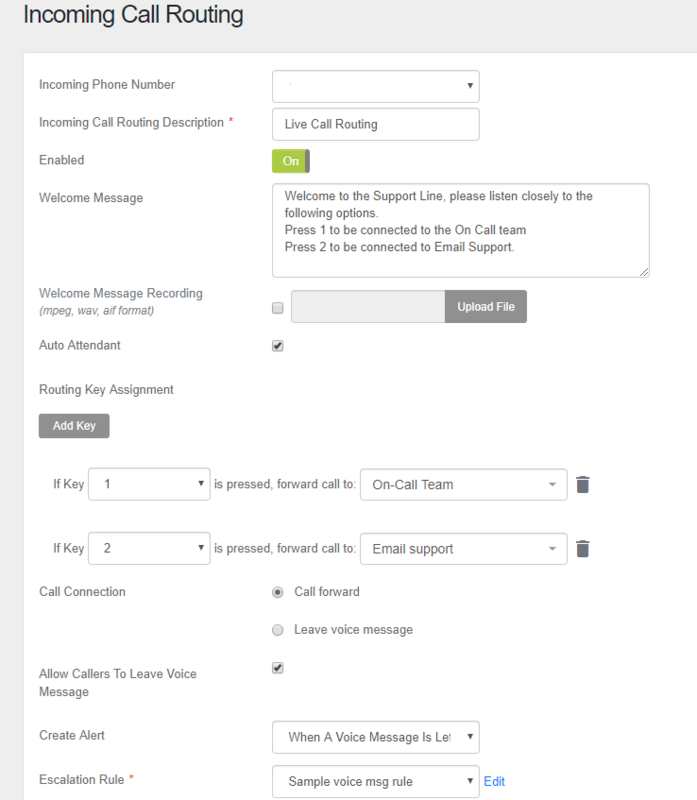 The Live Call Routing feature enables live phone calls from customers to be forwarded directly to your on-call team. You must contact AlertOps Support at support@alertops.com to have a Live Call Routing phone number configured. A customer dials your routing number. With only a single team configured, the call is automatically transferred to the on-call team member. An auto-attendant can be configured for multiple teams. Based on the team's on-call schedules, the call will be forwarded to on-call team members in sequence. If a team member has more than one phone number on their user profile, AlertOps will call each number. A team member must press 1 to accept the call. This prevents callers from going to team member's voice mail. If no one is reachable in the sequence, the caller will be asked to leave a voice-message. An alert will be created and the voice message is added as an attachment to the alert to notify the on-call team. From the menu bar, click Call Routing and then, click Call Routing. Enter an Incoming Call Routing Description for your Call Routing number. This description will be used as the Source for Alerts generated by calls. Check Enabled to enable the Call Routing. Uncheck to disable Call Routing. Enter a Welcome Message: a customized greeting to play for the caller. Or, upload a Welcome Message Custom Recording (mpeg, wav, or aif format) to play a recorded welcome message for the caller. Check Auto Attendant to enable callers to navigate between teams using a digit/key. Use Routing Key Assignment to assign a unique digit/key for each Team/Group. Or, if you are not using Auto Attendant, next to Forwarding Call to, select a Group for the calls to be forwarded to. Choose whether the call is forwarded to the desired team, or if callers are directed to leave a voice mail. Check Allow Callers To Leave Voice Message to enable callers to leave a voice message to be sent as an alert attachment to the specified Team/Group. Uncheck to disable voice messages. Choose to Create an Alert when a call comes in, or when a voice message is left using the drop-down menu. Select an Escalation Rule for voice message alerts. Check Call Simultaneously to enable calling of all the Team/Group members simultaneously. The first team member to answer and press 1 will receive the call. Uncheck to disable simultaneous calling. Check Show Caller's Caller ID to see caller's caller ID when receiving a call. Uncheck to disable Caller ID. When disabled, the Routing Number will be displayed in Caller ID, allowing for easy identification by team members. Select a preferred Language from the drop-down menu. Enter Settings for Dialing Phone Extensions. Add a 'w' for each 0.5 second wait time. Add '#' or '*' to the end. Enter a Waiting Time (In Seconds) Before Key Is Pressed To Accept The Call. This determines the delay before moving to the next team member in case the first attempt goes to the team member's voice mail. Enter a Waiting Message. This is the message heard by the caller while the system forwards the call. Enter a Screening Message. This is the message heard by the team member when receiving the forwarded call. Enter a No Response Message or upload a No Response Message Custom Recording to play when no one has answered the forwarded call. Enter a Recording Message to prompt the caller to leave a message. 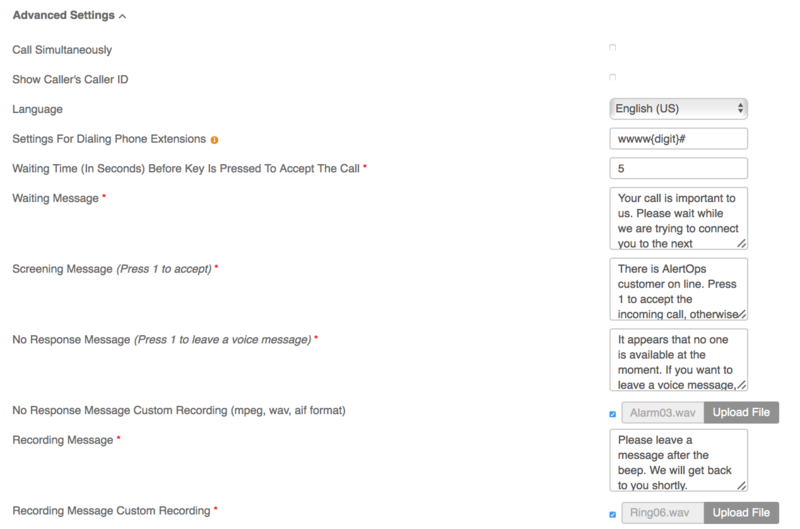 Alternatively, upload a Recording Message Custom Recording. From the menu bar, click Call Routing and then, select Call Activity. View call activity by date by selecting dates and clicking Search.